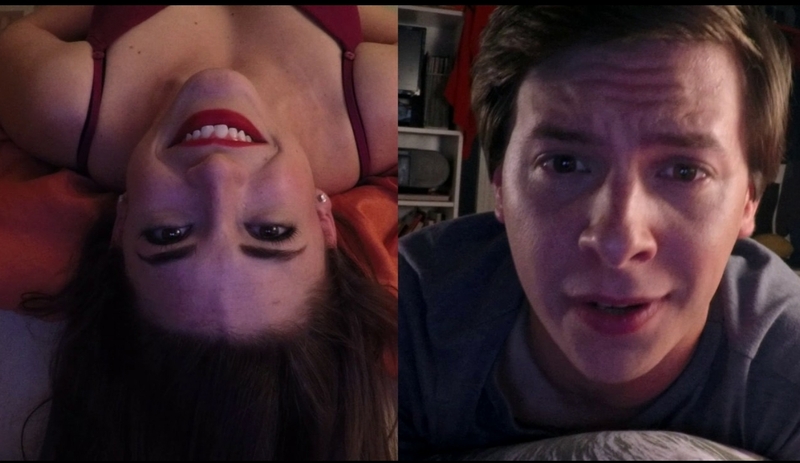 Face 2 Face sees Teel (Daniel Amerman) reconnecting with a childhood friend Madison (Daniela Bobadilla) via video chat. The two start to reveal things about one another during different chat sessions. Eventually, we learn one major secret from both participants and see the shame they both endure revealing these secrets to one another. Without spoiling, we get small, subtle hints about these secrets through the movie by dialogue between the only 2 characters that matter in the story. One secret is not too crazy as it is something that is a believable and is an actual issue that many people may go through and the other major secret is one that seemed a little too bizarre. Almost all of the film features both Teel and Madison going back and forth via video chats. We get to see Teel’s Mom and Madison’s Dad in small doses along with various other teens sprinkled here and there from cell phone video. The decision to keep Face 2 Face from the point of view of both lead’s computer desktop webcams and cell phones is a decision I thought would be too much of a gimmick. I was wrong as it works for the story to be played out. Amerman and Bobadilla both do good jobs as Teel and Madison. I took their performances of the modern teenager to be accurate as I have teen family members that can be insufferable and then be a beacon of warmth at the drop of a hat. Madison seems to snap over small comments made by Teel that he does his best to remedy the situation, but flounders and upsets Madison to a point where she became irritated and doesn’t chat with Teel for a few days. But there is giant growth from both characters that results in Teel taking big steps into leaving his comfort zone and Madison breaking a cycle that wouldn’t seem to end. Director and writer Matt Toronto made face 2 face (along with his brother Aaron Toronto) crafted a story that is consumable for everyone, yet it’s not a movie for everyone. An issue I had with the movie was there was a bit of down time between our two leads resulting from different arguments. We see both Teel and Madison meander in their room waiting for one another to respond for different hours into the night. If I was a teenager and someone wasn’t talking to me for one reason or another, I wouldn’t sit and stare at my desktop waiting. There is also a story point near the beginning of the film that is revisited midway through the movie that I found myself irritated with. It has to do with the reason why Teel found Madison after all this time and there is a giant burden placed on Madison that was I felt overlooked. I felt the scene before the last scene to end the movie would have been way better if it did not end unceremoniously. There was a tension in this scene that could have sent Face 2 Face into a different direction. I for one thought that it was going to end the movie on a different note. The film is under 90 minutes and is pretty well paced outside of the previously mentioned down time between the leads. Big missed opportunity near the end.